Toto není žádný italský spagetti western, ale poctivý a brutální grind/noise core v podání veteránů stylu, BRAINWASH!!! Vznikli už v roce 1992, hlavně jako živá kapela, takže nahrávek mají velmi málo, ale naživo je to skvělá a aktivní kapela. BRAINWASH na podiu je drcení not a chaos v nejlepším slova smyslu!!! Mají za sebou mnoho akcí. Support velkých jmen, účasti na známých tour jako Grind Over Europe a koncertování po celém evropském kontinentě!!! Banda okolo hlavního mozku, bubeníka Marca, se s tím opravdu nemaže a to poznáte na vlastní uši a oči ve středečním programu BACK TO 1999 OEF PARTY, kde BRAINWASH jako dávný účastník prvního OEF samozřejmě patří!!! Old school grind/noise core... to je BRAINWASH!!! BRAINWASH was born mainly as a live band, and made its debut on stage in 1992. From then on, they started an intense live activity throughout Italy open for bans like Malevolent Creation,Vader, Vital Remains, Sinister, Deranged etc. In 1997 began to go and play abroad: they took part to events like Grind Over Europe, Petrogrind Fest, Gods of Metal, Rotting in the Sun Fest, Fekal Party, Obscene Extreme Fest I° and many more; & play tours through out Europe with tons of extreme bands of the current scene from all over the world; we also played at overseas events (like the Maryland Death Fest in 2004). In 2007, for the 15th anniversary of live activity they tour in U.K., Finland, Russia & Czech Republic. Then The band hit the road to Poland for the first time with Antigama and Damnable and later to Crimea to participate in the Metal Heads' Mission Fest with Cryptopsy. 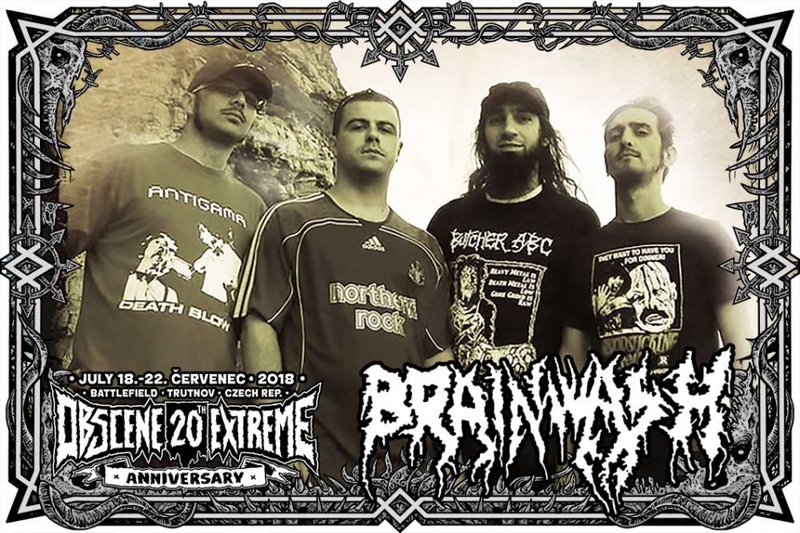 In 2009 Brainwash went back in Ukraine to play at the Zverovision Fest in Kiev, which will be followed by a tour in Russia. Thanx to the very good response They play again in St. Petersburg at Petrogrind VII, in Moscow at Coyote brutal Fest V. and at the UzhGoreRot Fest in Uzhgorod. The band keep going collect show & fests and celebrating anniversary show Like the Grind over Europe with Hemdale after 18 years from 1997 thath tour, and now after 2 decades they are ready to hit again the Obscene Extreme in Czech Republic were everithing is started.